There is a misconception that you have to rely on synthetic weight loss products in order to lose weight. The truth is that you can find plenty of natural foods, as well as condiments, you can eat and lose weight. 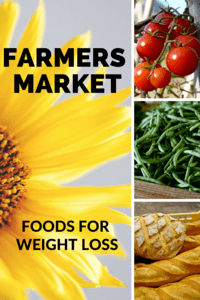 Today we will highlight some of the farmer’s market foods for weight loss. You can easily purchase these at your nearest farmer’s market. Whether in a salad, soup, or salsa, tomatoes are a refreshing way to load your diet with massive antioxidants while making every plate more filling. These are seriously lycopene-rich on their own, drizzling them with olive oil and tossing them on the grill can lend them some extra heart-healthy benefits while transforming their flavor. Just don’t try to derive the same benefits from ketchup; the sweet sauce is more sugar than the vegetable. A single cup of French beans consists of just 44 cals. They can constitute a side dish or you can include them in the main course. They primarily consist of manganese, vitamin E, potassium and even calcium. Thus, they are filled with the nutrients which are hard to obtain from other foods. When you are heading over to the farmer’s market, you will easily find a vendor’s selling fresh green beans. Whole-grain breads are often available in the farmer’s market. The advantage of whole-grain breads is they help in improving your digestion. Moreover, the cardiac function is also improved as well. They can help you in keeping your blood sugar level under control as well. Moreover, they do not consist of any kind of preservatives which is an added advantage. Thus, instead of opting for the packaged bread, it is a much better idea to get the whole-grain bread. Moreover, since the bread in the farmer’s market is fresh, you can be sure that the taste will be better as well. Thus, if you are specifically looking for the foods which you can buy from the local farmers market in order to lose weight; these are the 3 options which you should look at. All the 3 options, which we discussed above are immensely versatile and ensures that you are able to use them in a variety of different recipes without any problems.